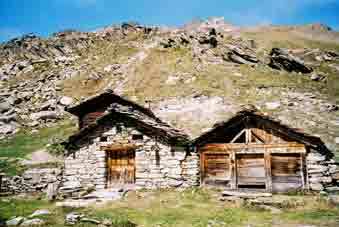 This is one of the places visited on the Chamonix-Zermatt tour the way I did it. 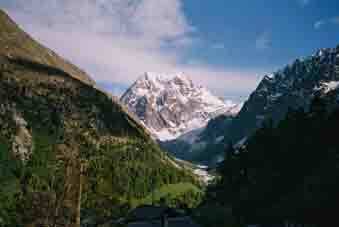 The Val d'Arolla branches West off the Val d'Herens which runs South of Sion in the Rhone Valley. To get there on public transport, there is a bus from Sion (you might have to change at Les Haudères) or walk in. I had a 'rest day' in Arolla on the tour. If you come in by bus, make sure you spot the Pyramids of Euseigne on the way. 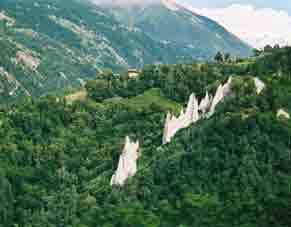 These are formed of glacier moraine protected by big stones on top & are World famous in Geological circles. 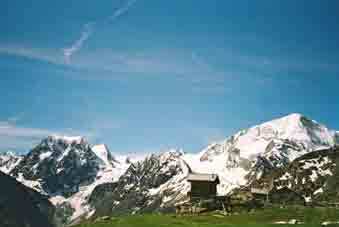 The village is a little above the valley. 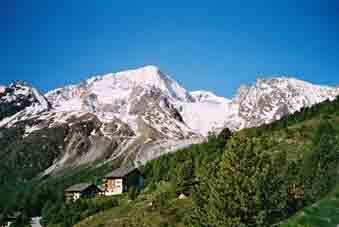 I stayed in the Hotel Pigne d'Arolla. Off-season, this is the only place to eat in Arolla, which is tiny. This link is to the village's own web site in English. 1. 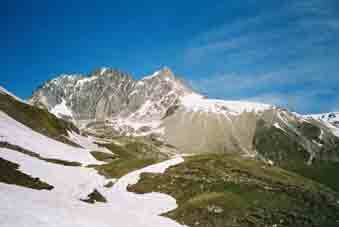 Up to the glacier under Mont Collon. Walk down the road & carry on South at the bend to the North. The road become jeep-track, path & pick your way from waymark to waymark across the stones. 2 hours if you stop & look at things! 2. To Pra Gra. 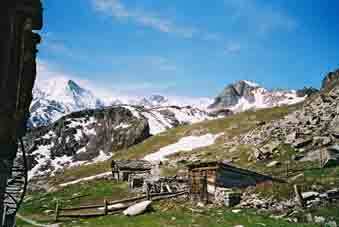 This is a cow village under the Aiguilles Rouges. 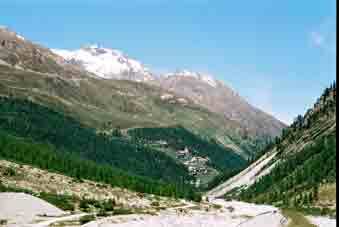 A jeep track runs up the hill from Arolla. Follow several zig-zags & a marked path heads off to the Aiguilles Rouge Hut & 'Tete du Tronc'. One can go up to the hut but I went in June & it was very snowy, so I just went to the Tete du Tronc viewpoint, where the whole West side of the Col de Torrent walk is exposed for contemplating the next stage in the Chamonix-Zermatt tour. Contact: Ken Baldry, 17 Gerrard Road, Islington, London N1 8AY +44(0)20 7359 6294 or e-mail him URL: http://www.art-science.com/Ken/Alpine/C-Z/ar.html Last revised 22/11/2010 © 2004-2010 Ken Baldry. All rights reserved.